From Director John Carpenter, In the future, crime is out of control and New York City is a maximum security prison. Grabbing a bargaining chip right out of the air, convicts bring down the President's plane in bad old Gotham. 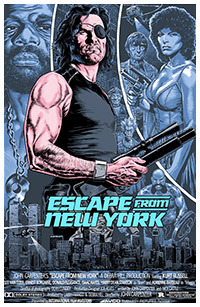 Gruff Snake Plissken, a one-eyed lone warrior new to prison life, is coerced into bringing the President, and his cargo, out of this land of undesirables.